For other places with the same name, see Satu Mare (disambiguation). Satu Mare (Romanian pronunciation: [ˈsatu ˈmare]; Hungarian: Szatmárnémeti [sɒtmaːrneːmɛti]; German: Sathmar; Yiddish: סאטמאר‎ Satmar or סאַטמער Satmer) is a city with a population of 102,400 (2011) and the capital of Satu Mare County, Romania, as well as the center of the Satu Mare metropolitan area. Mentioned in the Gesta Hungarorum as castrum Zotmar ("Zotmar's fort"), the city has a history going back to the Middle Ages. Today, it is an academic, cultural, industrial and business centre in northwestern Romania. Satu Mare is situated in Satu Mare County, in northwest Romania, on the Someș River, 13 km (8.1 mi) from the border with Hungary and 27 km (17 mi) from the border with Ukraine. The city is located at an altitude of 126 m (413 ft) on the Lower Someș alluvial plain, spreading out from the Administrative Palace at 25 October Square. The boundaries of the municipality contain an area of 150.3 square kilometres (58.0 sq mi). From a geomorphologic point of view, the city is located on the Someș Meadow on both sides of the river, which narrows in the vicinity of the city and widens upstream and downstream from it; flooded during heavy rainfall, the field has various geographical configurations at the edge of the city (sand banks, valleys, micro-depressions). The formation of the current terrain of the city, dating from the late Pliocene in the Tertiary period, is linked to the clogging of the Pannonian Sea. Layers of soil were created from deposits of sand, loess and gravel, and generally have a thickness of 16 m (52 ft)–18 m (59 ft). Over this base, decaying vegetation gave rise to podsolic soils, which led to favorable conditions for crops (cereals, vegetables, fruit trees). The water network around Satu Mare is composed of the Someș River, Pârâul Sar in the north and the Homorod River in the south. The formation and evolution of the city was closely related to the Someș River, which, in addition to allowing for the settlement of a human community around it, has offered, since the early Middle Ages, the possibility of international trade with coastal regions, a practice that favored milling, fishing and other economic activities. Because the land slopes gently around the city, the Someș River has created numerous branches and meanders (before 1777, in the perimeter of the city there were 25 meanders downstream and 14 upstream). After systematisation works in 1777, the number of meanders in the city dropped to 9 downstream and 5 upstream, the total length of the river now being at 36.5 km (22.7 mi) within the city. Systematisation performed up to the mid-19th century configured the existing Someș riverbed; embankments were built 17.3 km (10.7 mi) long on the right bank and 11 km (6.8 mi) on the left. In 1970, the embankments were raised by 2 m (6.6 ft)–3 m (9.8 ft), protecting 52,000 hectares within the city limits and restoring nearly 800 ha of agricultural land that had previously been flooded. The flora associated with the town of Satu Mare is characteristic for the meadow area with trees of soft essence like wicker, indigenous poplar, maple and hazelnut. Grassland vegetation is represented by Agrostis stolonifera, Poa trivialis, Alopecurus pratensis and other types of vegetation. The city's largest park, the Garden of Rome, features some rare trees that are uncommon to the area, including the pagoda tree, native to East Asia (especially China); Pterocarya, also native to Asia; and Paulownia tomentosa, native to central and western China. Fauna is represented by species of rodents (hamster and european ground squirrel), reptiles, including Vipera berus in the Noroieni forest, and as avifauna species of ducks, geese, egrets, during passages and systematic occasional wanderings. Satu Mare has a continental climate, characterised by hot dry summers and cold winters. As the city is in the far north of the country, winter is much colder than the national average, with minimum temperatures reaching −17 °C (1 °F), lower than values recorded in other cities in western Romania like Oradea (−15 °C (5 °F)) or Timișoara (−17 °C (1 °F)). The average annual temperature is 9.6 °C (49 °F), or broken down by seasons: Spring 10.2 °C (50 °F), summer 19.6 °C (67 °F), autumn 10.8 °C (51 °F) and winter 1.7 °C (35 °F). Atmospheric humidity is quite high. Prevailing wind currents blow in from the northwest, bringing spring and summer rainfall. Climate in this area has mild differences between highs and lows, and there is adequate rainfall year-round. The Köppen Climate Classification subtype for this climate is "Cfb" (Marine West Coast Climate/Oceanic climate). The Hungarian name of the town Szatmár is believed to come from the personal name Zotmar, as the Gesta Hungarorum gives the name of the 10th-century fortified settlement at the site of today's Satu Mare as castrum Zotmar ("Zotmar's fort"). 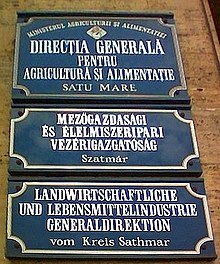 Until 1925, in Romanian, the name Sătmar was used, which is the Hungarian name transcribed to Romanian orthography. Since 1925, the name of the town in Romanian is officially Satu Mare, which is similar in pronunciation to the original name, and, by popular etymology, conveys meaning in Romanian, namely "great village". Archaeological evidence from Țara Oașului, Ardud, Medieșu Aurit, Homoroade, etc. clearly shows settlements in the area dating to the Stone Age and the Bronze Age. There is also evidence that the local Dacian population remained there after the Roman conquest in 101/106 AD. Later, these lands may have formed part of Menumorut's holdings; one of the important defensive fortresses – castrum Zotmar, dating to the 10th century – was at Satu Mare, as mentioned in the Gesta Hungarorum. After Stephen I of Hungary created the Kingdom of Hungary in the year 1000, German colonists were settled at the periphery of city (Villa Zotmar), brought in by Stephen's wife, the Bavarian princess Gisela of Hungary. Later, they were joined by more German colonists from beyond the Someș River, in Mintiu. A royal free city since the 13th century, Satu Mare changed hands several times in the 15th century until the Báthory family took possession of the citadel in 1526, proceeding to divert the Someș's waters in order to defend the southern part of the citadel; thus, the fortress remained on an island linked to the main roads by three bridges over the Someș. In 1562 the citadel was besieged by Ottoman armies led by Pargalı İbrahim Pasha of Buda and pasha Maleoci of Timișoara. Then the Habsburgs besieged it, leading the fleeing Transylvanian armies to set it on fire. The Austrian general Lazar Schwendi ordered the citadel to be rebuilt after the plans of Italian architect Ottavio Baldigara; using an Italian system of fortifications, the new structure would be pentagonal with five towers. After a period when it changed hands, the town came under Ottoman control in 1661. Called Sokmar by the new authorities, it was a kaza center within the Şenköy sanjak of Varat Eyalet. This status held until 1691, when Austria expelled the Ottomans during the Great Turkish War. In the Middle Ages, Satu Mare and Mintiu were two distinct entities. The two settlements, then called "Satmar" and "Nemeti", gradually united their administration between 1712 and 1715, and the resulting city was named "Szatmár-Nemeti". On 2 January 1721, Emperor Charles VI recognised the union, at the same time granting Satu Mare the status of royal free city. A decade earlier, the Treaty of Szatmár was signed in the city, ending Rákóczi's War for Independence. The city's importance was linked to the transportation and commerce of salt from nearby Ocna Dejului/Salzdorf, possibly already at a very early date. Due to the economic and commercial benefits it began to receive in the 13th century, Satu Mare became an important centre for craft guilds. In the 18th century, intense urbanisation began; several buildings survive from that period, including the old city hall, the inn, a barracks, the Greek Catholic church and the Reformed church. A Roman Catholic diocese was established there in 1804. In 1823, the city's systematization commission was established in order to direct its local government. In 1844, paving operations begun in 1805 were stepped up. The first industrial concerns also opened, including the steam mill, the brick factory, the Neuschloss Factory for wood products, the lumber factory, the Princz Factory and the Unio Factory. Due to its location at the intersection of commercial roads, Szatmárnémeti became and important rail hub. The Szatmárnémeti–Nagykároly (Carei) line was built in 1871, followed in 1872 by the Szatmárnémeti–Máramarossziget (Sighetu Marmaţiei) line, an 1894 link to Nagybánya (Baia Mare), 1900 to Erdőd (Ardud) and 1906 to Bikszád (Bixad). Since the second half of the 19th century, it underwent important economic and socio-cultural changes. The city's large companies (the Unio wagon factory, the Princz Factory, the Ardeleana textile enterprise, the Freund petroleum refinery, the brick factory and the furniture factory) prospered in this period, and the city invested heavily in communication lines, schools, hospitals, public works and public parks. The banking and commerce system also developed: in 1929 the chamber of commerce and industry, as well as the commodities stock market were established, with 25 commercial enterprises and 75 industrial and production firms as members. In 1930 there were 33 banks. After the collapse of Austria-Hungary, Romanian troops captured the town during their offensive launched on April 15, 1919. The Treaty of Trianon recognised the Union of Transylvania with Romania and Satu Mare officially ceased to be part of Hungary becoming part of the Romania. In 1940, the Second Vienna Award gave back Northern Transylvania, including Satu Mare, to Hungary. In October 1944, the city was captured by the Soviet Red Army. After 1945, the city became again part of Romania. Soon afterwards, a Communist regime came to power, lasting until the 1989 revolution. The presence of Jews in Transylvania is first mentioned in the late 16th century. In the 17th century, prince Gabriel Bethlen permitted Sephardi Jews from Turkey to settle in the Transylvanian capital Gyulafehérvár (Alba Iulia) in 1623. In the early 18th century, Jews were allowed to settle in Sathmar. Some of them became involved in large-scale agriculture, becoming landlords or lessees or were active in trade and industry, or distilled brandy and leased taverns on crown estates. In 1715, when Sathmar became a royal town, they were expelled, beginning to resettle in the 1820s. In 1841 several Jews obtained the permission to settle permanently in Sathmar, the first Jewish community was formally established in 1849, and in 1857, a synagogue was built. After a great number of traditional Ashkenazic Jews had settled in the town, the Jewish community split in 1898, when a supporter of the Hasidic movement was elected chief rabbi, into an Orthodox and a Status Quo community, led by a Zionist rabbi, which erected a synagogue in 1904. In the 1920s, there were several Zionist organizations in Satu Mare, and the yeshiva, one of the largest in the region, was attended by 400 students. In 1930, the city had five large synagogues and about 20 shtiebels. In 1928, a conflict within the Orthodox community broke out over the election of a new chief rabbi, lasting six years, ending in 1934 with the appointment of the Hasidic rabbi Joel Teitelbaum, a traditionalist and anti-Zionist, who later refounded the Satmar Hasidic dynasty in Williamsburg, New York. Another Hasidic rabbi, Aharon Roth, the founder of the Shomrei Emunim and Toldot Aharon communities in Jerusalem, was also active in Satu Mare. After Satu Mare was reannexed to Hungary in 1940, the civil rights and economic activities of the Jews were restricted, and in summer 1941, "foreign" Jews were deported to Kamenets-Podolski, where they were murdered by Hungarian and German troops. In 1944, the Jewish population was forced into the Satu Mare ghetto; the majority of men were sent to forced labor battalions, and the others were deported to the extermination camps in Poland, where the majority of them were murdered by the Nazis. Six trains left Satu Mare for Auschwitz-Birkenau starting May 19, 1944, each carrying approximately 3300 persons. The trains passed through Kassa (Košice) on May 19, 22, 26, 29, 30 and June 1. In total, 18,863 Jews were deported from Satu Mare, Carei and the surrounding localities. Of these, 14,440 were killed. Only a small number of the survivors returned to Satu Mare after the war, but a number of Jews belonging to linguistically and culturally different groups from all parts of Romania settled in the city. The majority of them later emigrated to Israel. By 1970 the town’s Jewish population numbered 500, and in 2011, only 34 Jews remained. In 2004, a Holocaust memorial was dedicated in the Decebal Street Synagogue's courtyard. Aside from the synagogues, two Jewish cemeteries also remain. Among the notable members of the local Jewish community have been historian Ignác Acsády, parliamentary deputies Ferenc Chorin and Kelemen Samu, politician Oszkár Jászi, writers Gyula Csehi, Rodion Markovits, Sándor Dénes and Ernő Szép, painter Pál Erdös, and director György Harag. The population of Satu Mare is decreasing by an average of 0.78% per year due to migration. According to the census conducted on 20 October 2011, Satu Mare had a population of 102,441, making it the 20th largest city in Romania. No religious group can claim a majority in Satu Mare, but as of 2011[update], there was a plurality of Romanian Orthodox believers (48.9%). Other important communities are Roman Catholic (19.8%), Reformed (19.3%), Greek-Catholic (8.0%) and Pentecostal (1.5%). The city government is headed by a mayor. Since 2016, the office is held by Gábor Kereskényi. Decisions are approved and discussed by the local council (consiliu local) made up of 23 elected councillors. The city is divided into 12 districts (cartiere) laid out radially. One of these, Sătmărel (Szatmárzsadány), is a separate village administered by the city. Additionally, as Satu Mare is the capital of Satu Mare County, the city hosts the palace of the prefecture, the headquarters of the county council (consiliu județean) and the prefect, who is appointed by Romania's central government. Like all other local councils in Romania, the Satu Mare local council, the county council and the city's mayor are elected every four years by the population. The city is at the center of the Satu Mare metropolitan area, a metropolitan area established in 2013, with a population of 243,600, and which includes 26 cities, towns and communes. The city day is May 14, which commemorates the devastating floods that affected the city in 1970, although it is also a day of rebirth. Satu Mare has a complex judicial organisation, as a consequence of its status of county capital. The Satu Mare Court of Justice is the local judicial institution and is under the purview of the Satu Mare County Tribunal, which also exerts its jurisdiction over the courts of Carei, Ardud, Negrești-Oaș, Tășnad and Livada. Appeals from these tribunals' verdicts, and more serious cases, are directed to the Oradea Court of Appeals. Satu Mare also hosts the county's commercial and military tribunals. Satu Mare has its own municipal police force, Poliția Municipiului Satu Mare, which is responsible for policing of crime within the whole city, and operates a number of special divisions. The Satu Mare Police are headquartered on Mihai Viteazul Street in the city centre (with a number of precincts throughout the city) and is subordinated to the county's police inspectorate on Alexandru Iioan Cuza Street. City Hall has its own community police force, Poliția Comunitară located on Universului Alley, dealing with local community issues. Satu Mare also houses the county's gendarmerie inspectorate. European route E58) and by rail (CFR Main Line 400). The total number of automobiles registered in Satu Mare was 82,000 in 2008. The city has around 400 streets with a total length of 178 km (111 mi) and cover an area of 1.3 km2 (0.50 sq mi). Satu Mare Rail Station, located about 2 kilometres (1.2 mi) north of the city centre, is situated on the Căile Ferate Române Line 400 (Brașov – Siculeni – Deda – Dej – Baia Mare), on Line 402 (Oradea – Săcueni – Carei – Satu Mare – Halmeu) and on Line 417 (Satu Mare – Bixad). CFR provides direct rail connections to all the major Romanian cities and to Budapest. The city is also served by another secondary rail station, the Saw Station (Gara Ferăstrău). The main public transportation system in Satu Mare consists of bus lines. There are twenty-three urban and suburban lines with a total length of 190.1 km (118.1 mi), the main operator being Transurban S.A. In addition, there are various taxi companies serving the city. It is worth mentioning that Satu Mare had a trolleybus system in the past, created on the 15th of November 1994 but has been closed in 2005. The city is served by the Satu Mare International Airport (IATA: SUJ, ICAO: LRSM), located 13 km (8.1 mi) south of the city, with a concrete runway, one of the longest in Romania, with TAROM and Wizz Air operating regular flights to Bucharest, London and Antalya (seasonal only). Football (soccer) is the most popular recreational sport in Satu Mare. There are two major football clubs in Satu Mare: Olimpia and Someșul Oar. There are two football stadiums in Satu Mare: Stadionul Olimpia with 18,000 seats and Someșul Stadium with 3,000 seats. Other popular recreational activities include fencing, handball, bowling, women's basketball, karate and chess. The local women's basketball team CSM Satu Mare is one of the best in the Romanian league; it finished third in the 2008/2009 season playoffs. The team plays its home matches in the largest indoor arena in the city, the LPS Arena, which has a capacity of 400 seats. The Cypriot professional tennis player Marcos Baghdatis was brought to Satu Mare in 1998 for a month and a half by his former coach Jean Dobrescu to train and to participate in local tennis competitions alongside his fellow Davis Cup team member, Rareș Cuzdriorean, who is also a Satu Mare native with Cypriot citizenship. Satu Mare has a tradition in fencing dating to 1885, and is the city that has supplied the most world and Olympic champions in Europe. Names like Ecaterina Stahl, Marcela Moldovan, Suzana and Ștefan Ardeleanu, Petru Kuki, Rudolf Luczki, Samuilă Melczhner, Geza Tere and in particular Alexandru Csipler figure prominently in the annals of Romanian fencing. The last four also formed the core of the city's fencing school, winning major local and international tournaments. Top results for which there is evidence date to 1935, when the local foil team, Olimpia Satu Mare, lost against CFR Timișoara by a score of 15–10 in the national final, while Rudolf Luczki won the sabre finals held in Cluj-Napoca. In 1973, the first signaling device in Romania was used in Satu Mare; this has been characterised as "a veritable revolution" for Romanian fencing. Satu Mare benefits from its proximity to the borders with Hungary and Ukraine, which makes it a prime location for logistical and industrial parks. Companies that have established production facilities in Satu Mare are Voestalpine, Dräxlmaier Group, Gotec Group, Anvis Group, Schlemmer, Casco Schützhelme and Zollner Elektronik in the industrial sector; FrieslandCampina in the food sector; Radici Group in the textile sector; and Saint-Gobain and Boissigny in the wood industry. Currently the largest private employer in Satu Mare is the German automotive company Dräxlmaier Group which owns since 1998 an electric engine components factory in the city and has around 3,600 employees. The factory supplies automotive wiring especially to the German car manufacturer Daimler AG but it also supplied wiring to another car manufacturer Porsche for its Porsche Panamera model. The Swedish company Electrolux owns a kitchen stove factory in the city acquired in 1997, that has a surface area of 52,000 square metres (560,000 sq ft) and 1,800 employees. The facility has an annual production capacity of around 1.2 million units and the majority of the Zanussi brand kitchen stoves in Europe are manufactured there. The Austrian company Voestalpine owns, since 2004, a steel tubes production facility with an annual capacity of 50 million units per year. The German company Arcandor has its main Romanian office established in Satu Mare. The subsidiary, accounting for the region formed by Romania and Hungary, is the most important among the 16 subsidiaries in Europe in terms of the percentage of sales through online orders having in 2008 total orders of €19.3 million. The company also owns a 40,000 square metres (430,000 sq ft) logistic facility and a call center in the city. Satu Mare's retail sector is fairly well-developed; a number of international companies such as Auchan, Kaufland, Billa, Metro Point, Lidl and Penny Market have supermarkets or hypermarkets in the city. There is also a DIY store, a Praktiker, and several small malls: Grand Mall of 6,000 m2 (65,000 sq ft), Plaza Europa of 3,000 m2 (32,000 sq ft) and the largest, Someșul Mall, of 13,000 m2 (140,000 sq ft). There is also an industrial park called Satu Mare Industrial Park located at the edge of the city on a 70 ha surface. The Grigore Moisil Gymnasium (Școala Generală Grigore Moisil), founded in 1903 and named after the mathematician Grigore Moisil. The Ion Creangă Gymnasium (Școala Generală Ion Creangă), founded in 1990 and named after the writer Ion Creangă. The Lucian Blaga Gymnasium (Școala Generală Lucian Blaga), founded in 1996 by Ioan Viman and named after the philosopher and writer Lucian Blaga. Satu Mare has a county museum, an art museum, and a theatre, the North Theatre, built in 1889 which has both a Hungarian and a Romanian section. Concerts are given by the “Dinu Lipatti Philharmonic”, formerly the state symphonic orchestra of Satu Mare, in a concert hall in a wing of the Dacia Hotel. The county library had 320.000 books in 1997, including a special bibliophile collections of over 70.000 volumes. There are several hotels in the city: three 4-star hotels – Hotel Poesis and Villa Bodi, Satu-Mare City; eleven 3-star hotels – Astoria, Leon, Villa Lux, Dacia, Aurora, Dana I, Dana II, Select, Rania, Melody and Belvedere; and one 2-star hotel – Sport. ^ a b c d e f g h "Geografie" (in Romanian). www.satu-mare.ro. Archived from the original on June 12, 2009. Retrieved 2009-06-22. ^ "Climate Summary for Satu Mare". Weatherbase. Retrieved 2013-06-25. ^ "Weatherbase data for Satu Mare". Retrieved 2009-06-22. ^ a b Paul Niedermaier (2008). Städte, Dörfer, Bauwerke. Studien zur Siedlungs- und Baugeschichte Siebenbürgens (in German). Böhlau Verlag, Köln/Weimar. p. 320. ISBN 978-3-412-20047-3. ^ a b c d e f g "History of Satu Mare City". Satu Mare City Hall. Retrieved 2013-06-29. ^ Paul Niedermaier (2008). Städte, Dörfer, Bauwerke. Studien zur Siedlungs- und Baugeschichte Siebenbürgens (in German). p. 139. ^ Patai, Raphael (1996). The Jews of Hungary. Wayne State University Press. pp. 154–161. ISBN 0-8143-2561-0. ^ a b c d e f Tamás Csíki. "Satu Mare". The YIVO Encyclopedia of Jews in Eastern Europe. ^ Nathan, Joan (2006-12-13). "From Hungary, For Hanukkah, From Long Ago". The New York Times. The New York Times Company. Retrieved 2008-06-25. ^ Tuvia Friling; Radu Ioanid; Mihail E. Ionescu, eds. (2004). "International Commission on the Holocaust in Romania, Final Report" (PDF). International Commission on the Holocaust in Romania; president of the commission: Elie Wiesel. ISBN 973-681-989-2. Archived from the original (PDF) on 2012-03-01. ^ "Let's not forget". www.jewishcomunity.ro. Retrieved 2009-06-14. ^ a b c "Comunicat de presă privind rezultatele provizorii ale Recensământului Populaţiei şi Locuinţelor – 2011" (PDF). Satu Mare County Regional Statistics Directorate. 2012-02-02. Retrieved 2012-03-06. ^ a b "History". www.jewishcomunity.ro. Retrieved 2009-06-14. ^ "Satu Mare Municipality-Romania" (PDF). Archived from the original (PDF) on 2013-10-22. Retrieved 2012-02-13. ^ "Etnikai statisztikák" (in Hungarian). Árpád E. Varga. Retrieved 2009-06-13. ^ "Populaţia stabilă după religie – judeţe, municipii, oraşe, comune" (in Romanian). National Institute of Statistics. Retrieved 2015-03-22. ^ "Kereskényi Gábor (UDMR) a câștigat Primăria Satu Mare" (in Romanian). România Liberă. 2016-06-06. Retrieved 2016-06-15. ^ "Membri consiliul local" (in Romanian). www.satu-mare.ro. Retrieved 2009-06-13. ^ "Districts of Satu Mare" (in Romanian). Transurban. 2009-06-13. Retrieved 2009-06-13. ^ "Urbanism, Satu Mare" (in Romanian). Satu Mare County Council. Archived from the original on September 25, 2010. Retrieved 2010-11-03. ^ "Law no. 215 / 21 April 2001: Legea administraţiei publice locale" (in Romanian). Parliament of Romania. Retrieved 2008-03-12. ^ "Vineri se constituie legal zona metropolitană Satu Mare" (in Romanian). Sătmăreanul. 2013-04-24. Retrieved 2013-05-20. ^ "Curtea de Apel Oradea" (in Romanian). Centrul Național de Informare Publică. Retrieved 2017-02-25. ^ a b c d e "Linii principale CFR" (PDF) (in Romanian). CFR.ro. 2009-06-03. Archived from the original (PDF) on 2007-09-27. Retrieved 2009-06-03. ^ "Linii urbane si sururbane" (in Romanian). Transurban. 2009-06-03. Archived from the original on 2009-05-22. Retrieved 2009-06-03. ^ "Turul Micula va juca în Liga a III-a pe Stadionul Olimpia" (in Romanian). www.informatia-zilei.ro. 2009-06-25. Archived from the original on 2009-06-28. Retrieved 2009-06-25. ^ a b Andrei Aricescu; Ecaterina Albici; Doru Radosav; Ovidiu Șerbănescu; Constantin Pohrib (1984). Ghid de oraș. Satu Mare (in Romanian). Satu Mare: Editura Sport-Turism. ^ "CSM Satu Mare" (in Romanian). www.numaibaschet.ro. 2009-05-21. Archived from the original on 2009-06-17. Retrieved 2009-05-21. ^ "Vedeta Australian Open s-a antrenat in Ardeal" (in Romanian). stiri.acasa.ro. 2006-01-25. Retrieved 2009-06-14. ^ "Campion in tara lui Marcos Baghdatis" (in Romanian). www.gazetanord-vest.ro. Archived from the original on 2009-06-14. Retrieved 2009-06-14. ^ "Un sătmărean în echipa de Cupa Davis a Ciprului" (in Romanian). www.satumareonline.ro. 2009-06-11. Retrieved 2009-06-14. ^ "Scurt istoric al scrimei sătmărene" (in Romanian). www.satu-mare.ro. 2009-05-21. Archived from the original on February 8, 2009. Retrieved 2009-05-21. ^ "Satu Mare". www.draexlmaier.de. Archived from the original on 2009-07-24. Retrieved 2009-06-23. ^ "Gotec Satu Mare". www.gotec-group.com. Archived from the original on 2011-07-11. Retrieved 2009-06-23. ^ "Anvis Satu Mare". www.anvisgroup.com. Retrieved 2009-06-23. ^ "Satu Mare plant 1". www.zollner.de. Archived from the original on 2009-05-12. Retrieved 2009-06-23. ^ "Satu Mare plant 2". www.zollner.de. Archived from the original on 2009-05-12. Retrieved 2009-06-23. ^ "De ce a concediat Draxlmaier 9.000 de angajaţi: "Avem nevoie de ingineri, nu de oameni mulți în producţie"". Ziarul Financiar. Retrieved 2010-08-24. ^ "Electrolux, primul an de scadere in Romania". Wall-Street (in Romanian). 2007-03-23. Retrieved 2009-10-23. ^ "Harta marilor investiţii străine". Saptamana Financiara (in Romanian). 2008-05-16. Archived from the original on 2008-06-01. Retrieved 2009-10-23. ^ "Quelle, campioană la noi, pe butuci la nemţi". Adevarul (in Romanian). 2009-10-21. Archived from the original on 2009-10-23. Retrieved 2009-10-23. ^ "Grand Mall" (in Romanian). www.grand-mall.ro. Archived from the original on 2009-04-29. Retrieved 2009-06-23. ^ "Plaza Europa" (in Romanian). www.satu-mare.ro. Retrieved 2009-06-23. ^ "Centrul Comercial Someșul" (in Romanian). www.somesul.com.ro. Retrieved 2009-06-23. ^ a b c d e "Învăţământ superior" (in Romanian). www.satu-mare.ro. Retrieved 2009-06-29. ^ "Facultati/Universitati Satu Mare" (in Romanian). www.stirilocale.ro. Retrieved 2009-06-29. ^ a b c d e "Licee, Colegii" (in Romanian). www.satu-mare.ro. Retrieved 2009-06-29. ^ a b c d "Școli" (in Romanian). www.satu-mare.ro. Retrieved 2009-06-29. ^ "ȘCOALA CU CLASELE I-VIII "GRIGORE MOISIL"" (in Romanian). www.satu-mare.ro. Retrieved 2009-06-28. ^ "ȘCOALA CU CLASELE I-VIII "ION CREANGĂ"" (in Romanian). www.satu-mare.ro. Retrieved 2009-06-28. ^ "SCURTĂ MONOGRAFIE" (in Romanian). www.l.blaga.go.ro. Archived from the original on 2008-12-01. Retrieved 2009-06-28. ^ "Museums". Satu Mare official website. Retrieved 2012-02-13. ^ "The North Theatre". Satu Mare official website. Retrieved 2012-02-13. ^ "Dinu Lipatti Philharmonic". Satu Mare official website. Retrieved 2012-02-13. ^ "The County Library". Satu Mare official website. Retrieved 2012-02-13. ^ "Informația Zilei" (in Romanian). www.mediaindex.ro. Retrieved 2009-06-24. ^ "Gazeta de Nord-Vest" (in Romanian). www.mediaindex.ro. Retrieved 2009-06-24. ^ "Friss Újság" (in Hungarian). www.mediaindex.ro. Archived from the original on 2009-01-30. Retrieved 2009-06-24. ^ "Magyar Hírlap" (in Romanian). www.mediaindex.ro. Retrieved 2009-06-24. ^ "Consulat al Ucrainei la Satu Mare" (in Romanian). www.satumareonline.ro. 2008-10-03. Retrieved 2009-06-27. ^ "Zutphen – Olanda" (in Romanian). www.satu-mare.ro. Retrieved 2014-09-12. ^ "Wolfenbüttel – imaginea unui oraş" (in Romanian). www.satu-mare.ro. Retrieved 2014-09-12. ^ "Nyíregyháza – Ungaria" (in Romanian). www.satu-mare.ro. Retrieved 2014-09-12. ^ "Beregovo – Ucraina" (in Romanian). www.satu-mare.ro. Retrieved 2014-09-12. ^ "Rzeszow – Polonia" (in Romanian). www.satu-mare.ro. Retrieved 2014-09-12. ^ "Informacja o partnerstwie miast". www.rzeszow.pl. Retrieved 2014-09-12. Wikivoyage has a travel guide for Satu Mare.